Profile, analyse and tune your code. Parses any callgrind file generated by many languages including Ruby, Python, C++, PHP, Perl. Shows drillable excution call tree and caller/callee, with generic cost support such as timing and memory. Structual code graphs for analysing code structure. Treemaps for relative comparisons and exception discovery, with various heat map metrics. Fast to open. Fast to parse. Fast to display. Supports multi–profile files and compressed labels. Requires macOS 10.13 or above and supports Dark Mode in 10.14 and above. MCG parses most callgrind files but has specific syntax highlighting and markup for those working with PHP (Xdebug), Ruby or Python. We provide highlighting for includes, language and application functions. With icon markup for functions, class method and instance methods you'll be able to find the function you're looking for in no time. 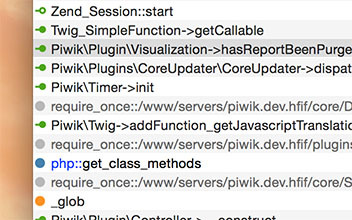 Or just use our built in function search to jump directly to the function you're interested in. 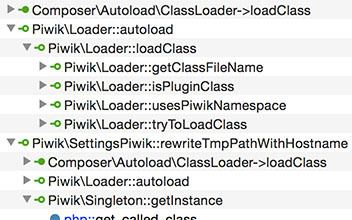 If the callgrind file is in a specific format, we go one further and give you a full call hierarchy. Currently supported in Xdebug files, MCG can help you nail the performance issue you have with one of the world's favourite web scripting languages. MCG ships with a number of structural overview graphs and treemaps to help you visualise what your application is doing. 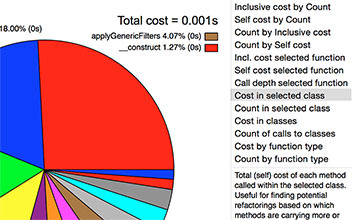 Find out if you're spending all your time in language or application functions, which classes are doing most of the work and specifically which functions in those classes. MCG helps you target the functions you need to be high performing by identifying code for performance regression testing. "A client came to me with CPU spike causing traffic delays. The sysadmin hooked up xdebug and profiled some stuff during these spikes, but they couldn't make heads or tails of it. Your software allowed me to bill a couple hours I wouldn't have -- so the software paid for itself as soon as it downloaded.